Full size cordless circular saws are a relatively recent addition to the power tool industry. We’ve had a number of 6-1/2″ models around for while, but nailing down the power and run time to make a 7-1/4″ worthwhile has taken longer. 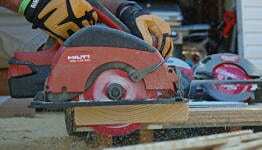 There are 3 major players in the full size cordless circular saw world: Hilti, Makita, and Milwaukee. Hilti’s WSC 7.25-A36 circular saw has actually been on the market for about 3 years now. As a manufacturer of some of the best industrial tools on the market, their 36 volt platform was ready for a full size player. Makita introduced their 7-1/4″ cordless circular saw as part of the 18V X2 Lithium-Ion line of tools. When we reviewed the XSH01Z, we gave it the title of “Top Performing Cordless Circular Saw” on the market. We’ll have to see if it gets to keep that title. At the beginning of October, Milwaukee introduced their full size cordless circular saw; the M18 Fuel 7-1/4″ Circular Saw. This one runs on a single M18 RedLithium Battery, so we’ll see if it can keep up with the 36V and 2 x 18V platforms of its competition. Have you noticed the number of power saws that are beginning to replace the stock manufacturer blades with Diablo? I have, and there’s a very good reason for it. Diablo makes outstanding blades, period. They are a great testament to the quality and innovation that can be produced when you really focus in on one area. We worked with reps from Diablo to determine the best blade for the type of testing we were doing. I mention that to prove a point. Many people would have said, “just grab a wood framing blade.” The folks at Diablo know that there’s more to it than just material. They helped us select the blade that was optimized for the type of material, thickness of material, and specific tools that we were going to be testing. These people know blades. The Demo Demon is a multi-purpose blade rated for framing, demolition, siding, decking, roofing, and masonry. Often with multi-purpose blades, you have to sacrifice speed for the additional flexibility. Not so with the Demo Demon. It cuts through easily and allows the saw to transfer much more power to keep the blade spinning faster and more efficiently. The Diablo Demo Demon features 3 innovations from the minds at Freud. Pyramid Tooth Geometry is a three tooth grind sequence that improves tracking control and cutting efficiency. For impact resistance and durability, Dura-Blend Ti-Co Carbide is applied to each blade. Finally, Lock-Tooth design provides the strongest tooth to blade connection on the market. After all, the most efficient cutting blade in the world can’t work if the teeth don’t stay on! As with all accessories, they play their part the best when you don’t have to think about them during work. A bad blade would have us looking at our cordless circular saws in frustration. Great blades like the Diablo Demo Demon allow us to focus on the attributes and features of each saw as we evaluate them. During prelim testing and once the saw dust settled, we were able to take a moment to breathe and realize just how smooth these blades are. The majority of circular saws on the market today are doing primarily one job – cutting wood. With that being the case, our testing methods are going to be in that realm. Full size cordless circular saws have to answer two basic questions. Can it cut as well as a corded saw? How long will the battery(ies) last? To answer those questions, we’re going to put our saws through two basic, but very applicable tests. The first test will evaluate the power of the saw. Each saw will make 3 cuts through four sheets of four foot wide stacked OSB. The cuts will be made as quickly as we can without bogging down the blade. Each saw will be rotated after every cut to minimize heat buildup and each test will be timed. Why four sheets of OSB? This is a standard stress test near the maximum cutting depth of a 7-1/4″ blade. Second, we’re going to test the run time. To so this, we’re making cross cuts into a pressure treated 2 x 10. Since all three saws have the potential to make well over 100 cuts, we’re going to rotate each saw every 5 cuts. This will help to reduce the amount of heat that builds up in the tool and battery, and should maximize the run time for each saw. Each cut will begin by bringing the saw to full power and immediately starting the cut. The cuts will made at a speed that is as fast as the saw can cut without beginning to bog down the blade. As soon as each cut is complete, the blade will be allowed to come to a complete stop before lining up the next one. That will all of this tell us about our full size cordless circular saws? The number of cuts will tell us which saw is getting the best run time under load. The time to cut through the four feet of stacked OSB will tell us which saw has the most power realized under load. On paper, we can look at volts, amp hours, and speed, but the real potential of each saw can only be found when in use. 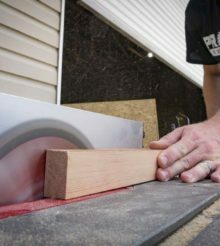 In order to test the ability to cut through four sheets of stacked OSB, the first thing I had to do was make a few test cuts to determine the most efficient grip for each saw and how hard I could push it to stay within the testing parameters of not bogging down the blade. Once I found the best for each saw, I was surprised at how fast they were cutting with that Diablo Demo Demon Blade. As you can see, Makita has the fastest average cut time. Hilti had the fastest single cut, and Milwaukee was the most consistent. One thing that surprised me was that Milwaukee’s data was consistent from start to finish. Even during the test cuts Milwaukee did not stray far from its average cut time. During testing, I tweeted out that each saw had at least one cut under 10 seconds. It was great to see those cuts get smoother and faster as each saw found its happy place. There’s not really much interpretation to be done here. Hilti blew away their competition by cutting 29% longer than Milwaukee and 46% longer than Makita. All three full size cordless circular saws were at full power for every cut up until the last two full cuts. Interestingly enough, there was a noticeable slow down on the last two cuts, and then a failure to complete a final one. It was the same for each saw regardless of the battery platform. I should mention something here about testing using this method. It is unwise to completely drain your Lithium-Ion battery the way that we did for this test. It can limit the life of the battery and, if used at high temperatures for an extended period, can actually damage them. Hilti clearly is the endurance winner with 172 cuts in or run time test. It also had the fastest overall cut and an average cut under 8 seconds in our stress test. What’s not quantifiable in our data is how smooth this saw is. It’s “hot knife through butter” kind of smooth. Despite having the slowest rated speed of 4,000 RPM, it has the torque to maintain that cut speed through stressful loads. 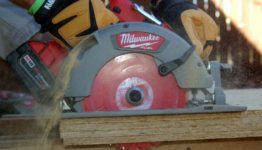 During testing, it became clear that the blade came to a stop much slower than Makita and Milwaukee. While this is hardly a deal breaker, it is a point worth making. Blade changes were fairly easy to perform on this saw. The hex wrench is actually hidden underneath the motor. This is a change from most saws that store them elsewhere on the handle or body, but once you know where it is, it’s actually pretty convenient. The downside is that this 7-1/4″ cordless circular saw is that it’s heavy. It’s a beast of a tool that is designed for serious work… and it comes with a serious price. The kit as we tested it runs $719.00. On the other hand, it also has a lifetime manufacturer’s warranty and two year no charge service agreement. There is little doubt that the Hilti WSC 7.25-A36 is King of the Cordless Circular Saw World. …the saw that gets the most run time. …the saw that cuts the smoothest. …the saw that has the fastest potential cut. …the saw with the longest manufacturer’s warranty. …you need a light weight or one handed use saw. While Makita may have lost its crown as king of the 7-1/4″ cordless circular saw world, it is by no means substandard. When it came to making the straightest cuts following a drawn line, this XSH01Z tracked the easiest. It also had the fastest average cut speed and was the only saw to have all 3 tests come in under 8 seconds. The ergonomics of this saw are outstanding. A two handed grip feels extremely comfortable when using the Makita. The batteries we were using have a 30 minute charge time, making them the fastest of the group. Even the 4.0’s should charge in 40 – 45 minutes. You’ll just need two chargers if you expect to be back fully charged after a 30 minute lunch break. The Makita XSH01Z had the easiest blade changes of the three. The spindle lock mechanism was easy on my thumb and the actual locking point was the easiest to find and slip into on this saw. If I could ask for just one thing, it would be a touch more clearance with the blade guard to help the blades slip in a little easier. …the saw with the easiest tracking. …the saw with the fastest average cut speed. …the saw with the most natural two handed feel. …using two batteries at once is going to slow you down when you need to recharge. …you need to make an extreme number of cuts on a single charge. Some people may look at the speed data alone and miss how outstanding the 2731 really is. From full charge to dead empty, this saw has the most consistent cut speed of the three. The way that it is laser etched and removes saw dust made it the easiest measurements to read during the cutting process. It was also the only saw that I was able to use one handed comfortably and consistently. A simple, yet very welcomed feature is the rafter hook. As the lightest in the group, that’s likely to come in handy if you’re cutting from an elevated position. While it did have the slowest cut speeds in out stress test, it’s hard to consider a sub 9 second cut through stacked OSB as a negative. Milwaukee’s standard charger will have you waiting for well over an hour for the 5.0 amp hour battery to charge, but the new rapid chargers will bring that time down to rival Makita’s. …the saw with the most consistent cut speed. …the ability to see the etched measurements while cutting. …a full size cordless circular saw you can use one handed. …a saw you can hang on a rafter or ladder when not in use. …the lightest full size cordless circular saw. …you need the most speed possible. …you need to make an obscene number of cuts on a single charge. Already bought one of these saws? You should feel absolutely no buyer’s remorse whatsoever. Each of these saws is outstanding on their own and have strengths along with minor weaknesses. If you’re already invested in a battery family, stick with that manufacturer. It’s not often we can test a class of tool a come away without being disappointed by any of them. I can honestly recommend any of these three 7-1/4″ cordless circular saws without hesitation and walk away knowing you’ll be satisfied. I have the new DeWalt 60v Max 7.25 circular saw. 5800 rpm, 1600 watts out. I have not used a corded saw with more power than this brushless beast. Have you guys completed the same review/test of the new Ridgid 7.25 brushless saw? I read your thorough review of the 18V brushless drills, awesome, and now I am curious if the Ridgid saw can hang with the other 7.25 cordlesses on the market. I assume some others have introduced new saws as well? love to hear your thoughts.